All about the best team in the land and all the world Manchester City!!! : Johnson signs!!! 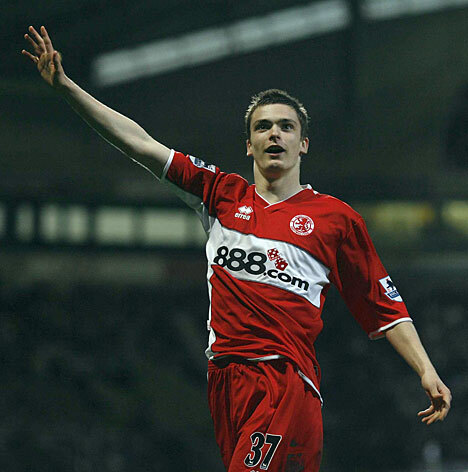 We have beat the transfer deadline and completed the signing of left winger Adam Johnson from Middlesbrough. Johnson has signed a deal that will last until June 2014, the fee is believed to be around six million pounds although the club have only officially referred to the fee as undisclosed. This is a good signing, Johnson is not a bad player at all. He has been impressive for the last couple of seasons and because of his good displays he has attracted the interest of Real Madrid and Chelsea as well as a host of other clubs. It is good to see City sign another good young British player, that can only help us considering the rule that is due to come in on having a set amount of home growns in your match day squad. I am pleased with this signing especially considering we signed him for a fee that could prove to be a snip should Johnson reach his full potential, hopefully he can come straight into the team and maybe even push for a World Cup place. What do you think? Are you a Johnson fan? the deal is fine, but it's not what we really needed. The middle was where mancini wanted to reinforce and we didnt. Mariga farce really hurts, now that he's joined inter. What a big error from cook and co! It wasn't anybody's fault that we missed out on Mariga, as far as we know he could not get a work permit and that seems to be true. I think we did need a left winger, we have just loaned out Robinho and Petrov is rubbish. Johnson can also play on the right. johnson is a very good signing. he is a talanted man with lots of potential. i also think that we have enough midfield cover without gago or mariga. Chelsea up next if we beat Stoke! Win a Man City shirt!! !